The first branch of Toronto's semi-subterranean streetcar route opened in 1990. At that time, Union Station acquired an extensive new subterranean component, twin 1/4 mile long tunnels were carved under Bay Street and the rail viaduct, and Toronto acquired its southernmost station, Queens Quay. Seven years later, in July 1997, the rest of the LRT finally opened. Toronto's new LRT system now connects the underground playgrounds of Union, Queens Quay and Spadina stations and provides many wonderful new opportunities for the urban explorer. The new 510 Spadina LRT route now carries passengers along Spadina Ave. from Bloor St. to Queens Quay, then along Queens Quay to Queens Quay station and back to Union. A small mechanical room, with an emergency exit to the street, is tucked behind the least effective do not enter gate in the world. Naturally, one can obtain a much clearer view of the stations and tunnels from outside the LRT car. A tour of the LRT system is a delightful appetizer for exploration of the subway proper, as it allows one to experience the joy of transit tunnels without risking one's life much. The new 510 route operates between 5am and 2:30am daily. All normal entrances to the tunnel system are sealed during the two-and-a-half-hour rest period. Naturally, the best times to see the tunnels are very late at night and very early in the morning. The Harbourfront-Spadina route begins in the TTC-owned area of Union Station, the mammoth hub of Canadian rail transport. After entering the fare-paid zone, follow the signs labelled "Harbourfront LRT" and the sweet scent of wet cement and fish. The LRT section of Union Station is a large U shape: streetcars drop off their northbound passengers on one half of the U and collect new southbound freight on the other. The LRT tracks are at the platform level, meaning one need not descend to track level to begin wandering the tunnels. The "Danger: Do Not Enter" gates at either end of the station are quite possibly the least effective gates constructed in all of human history and can be safely disregarded. The best time to walk onto the tracks and enter the tunnels is immediately after a streetcar has left the station, as there will be very few spectators and another LRT car won't be along for a while. A small maintenance area lies immediately south of Union between the northbound and southbound tracks. This area is worth examining, but keep in mind that it is brightly lit and quite visible to the driver and all passengers on the LRT car, so appoint one person to watch the tunnels or at the very least keep your ears peeled for the bloodcurdling ding of the streetcar bell. 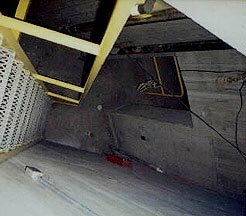 A yellow ladder leads up to a street-level manhole cover which could provide an escape route in an extreme emergency. The glorious man-made caves heading south to Queens Quay station. 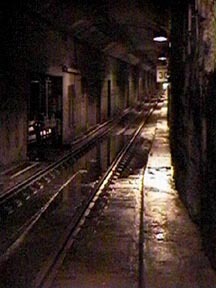 The tunnels between Union Station and Queens Quay are unique in the entire rapid transit system, as their walls are not smooth cement but dark, jagged rock, giving the tunnels the appearance of natural caves and making them considerably harder to resist. The tunnels are narrow and tall. The ground is usually quite wet, and at points the groundwater accumulates into large puddles. The LRT cars are powered by electrical wires in the ceiling, rather than by an electrified rail at track level, so there is little danger of electrocution (but don't quote me on that if you die). The tunnels begin as two entirely separate passages just south of Union but before long they converge somewhat, allowing the tunnel runner the option of jumping back and forth between the two passages through holes in the middle wall. After a five-to-ten-minute stroll through the cave-like tunnels, one emerges into the utterly delightful Queens Quay station. I have always had a soft spot for this colourful station, which is painted with pastel blue, subdued green, shiny red and bright white. This appearance, coupled with its wet feel and fishy smell, makes this station seem like a quaint European seaside town. The tunnels to the south of Queens Quay turn abruptly to the west and quickly ascend to street level. The LRT continues the rest of its 3.7-kilometer journey along the centre lanes of Queens Quay and Spadina until it approaches its northern terminus at Spadina Station. On Spadina a fair distance south of Bloor Street, the LRT again plunges into the earth, and enters an extremely large tunnel network consisting of a very broad turning loop and various support tunnels. 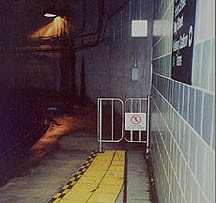 The light gray cement tunnels are both tall and wide; as at Union and Queens Quay, the platform is at track level and there are no electrified rails, making it quite tempting to steal away into the tunnels. 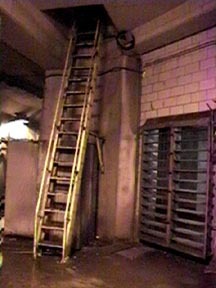 During the construction of the Spadina loop I spent over an hour exploring the various tunnels, engine rooms and ventilation shafts, and also discovered ladders leading up to street level and holes leading down to the sewers underneath the station. Nothing was locked  it was fantastic. Late one night shortly before the opening of the new line, I revisited the Spadina LRT station to check on its progress, ducking through a tiny little hole in the drywall, and was surprised to find that security cameras had already been installed and were quite operational. I quickly left and scurried upstairs to the collector's booth to peer at the security monitors and see what the collector had seen. The monitors presented a clear view of the platform where I had just been trespassing, and the collector was alternating between looking at the monitors and scowling at me, while speaking to someone on the phone, so I decided to call it a night and flee. This article originally appeared in Infiltration 5, together with articles on exploring the subway tunnels and the abandoned subway stations (Lower Bay and Lower Queen).